It’s my goal to help guarantee that 2017 will become your best year ever. There will be no more wishing. Instead, this is the year of accomplishing. Of course, if you want this to be true for you, then things probably need to shift and you have to make some small but necessary changes to start the ball rolling. 1. You have to believe this can become your best year ever. You have to expect it. Any other attitude will keep you tethered to littleness. There’s a genuine force that begins to stir the moment you believe in this possibility. 2. You have to take action. Without action, nothing will happen. So act. If you want this year to be different from last year, then expect change. Change is good; change is exciting! Here is the program and master who can help you create the lifestyle, the financial rewards, and — flat out — the pure joy to make this year the most amazing year in your life. 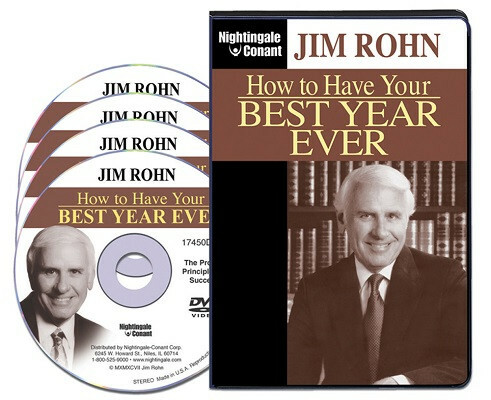 Let me introduce you to the perfect person to guide you to your best year ever, Jim Rohn. Mr. Rohn was a proven master of accumulating wealth, both monetary wealth and emotional wealth. He developed the unique skill of teaching others, in unprecedented numbers, to achieve transformational levels of success. I’m not talking little steps; I’m talking about the major critical steps necessary for true achievement. Jim’s mastery was in helping people adapt to life’s ever-changing situations. That’s where most people get lost. It’s easy to develop a path to success when there is never any change. But that’s not the world we live in. In this program, Jim teaches the fundamental strategies that can help you create the success you seek. By following those strategies, you will not only be able to weather changing circumstances, you’ll be able to benefit from them. In his unique and magical style, Jim will help you refine the skills for changing your life and making this year your best ever… guaranteed. Keep in mind when you sit down to enjoy Jim Rohn in this “live” video seminar, you’ll be treated to a life-changing process that is shared and followed by only about 2% of the world’s population — the wealthiest, most successful, happiest, and highest achieving individuals. With Jim’s guidance, you’ll uncover new ways for developing, using, and improving your success skills, which will guarantee you a place in that top group of winners. In this series, Jim Rohn is ready to show you — not only how to change yourself, but how to keep growing, and how to make each new year better than the last. The sooner you take the right action steps, the sooner you’ll be on your way to making 2017 your best year ever! Jim spent more than 40 years updating and refining his teachings and techniques to reflect what you’ll need… not only to make your immediate future better, but to make the rest of your life as rewarding as it could possibly be. This four-DVD program will provide you with the tools and confidence you need to get all the way there — and then go miles beyond it! In How to Have Your Best Year Ever, Jim Rohn helps guide you to astounding levels of personal and professional success. P.S. Please reply quickly to this exclusive discount offer. The sooner you act, the sooner you’ll be on your way to making 2017 your best year ever! YES, I want 2017 to be my best year ever! Please send me the complete 4-DVD How to Have Your Best Year Ever video series for only $59.95, which is 70% OFF the regular price. I understand that by following the ideas laid out by Jim Rohn, I can follow countless thousands of others to a life full of financial and personal rewards. If I'm not completely satisfied, I may return the video series within 30 days for a complete refund of my purchase price.